We will go over the symptoms of a bad modem and some test and diagnostics to help you find out if you have a bad or dying modem. A failing modem can be tricky to diagnose without the proper testing and troubleshooting. The rumors are true, there is a large batch of bad modems circulating retail outlets and even being rented out by internet service providers. But what makes these modems so “bad”. Several factors that stem from the Puma 6 chip. But first, here are the best cable modems to solve your problems and save you $10 a month. The bad modems are susceptible to DoS Attacks. DoS stands for Denial of Service. A DoS attack can prevent you from accessing the internet at all for days at a time with no solution. Your ISP can not help you and likely won’t even be able to detect the source of your connection slow down or admit that you have a broken modem. But the fun does not stop there. The bad modems symptoms also experience large spikes in latency. This is called lag. It can halt or freeze your internet without reason or timing or notice. This is the worst part because you are not likely to be a target of a DoS attack but you will experience spikes in ping no matter what. Do I Have A Bad Modem? There are a lot of them on the market because the flaw was not noticed til after they hit retail and people all over started reporting problems. As it stands they all have Intel’s Puma 6 chip. The moment this problem was identified, manufactures started using the superior Broadcom chip for all future modems such as the newest and fastest DOCSIS 3.1 Gigabit modems. This means that any cable modem with a Broadcom chip is on the safe list of good modems. 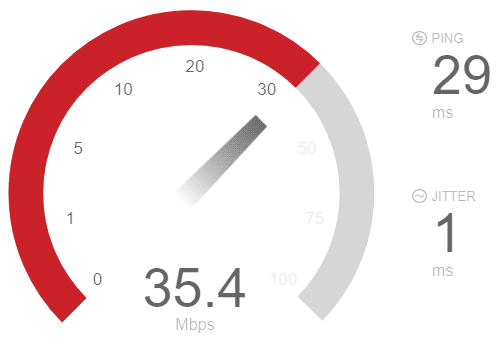 The problem with these bad modems, is that if you call your ISP and tell them your internet is having issues, they will say everything is fine because they can not detect this issue on their end. This leaves millions of customers frustrated and saying things like “I called Comcast several times and they are unable to fix my internet“. How did these bad modems get released? The dilemma is they never tested for latency until this issue became wide spread. 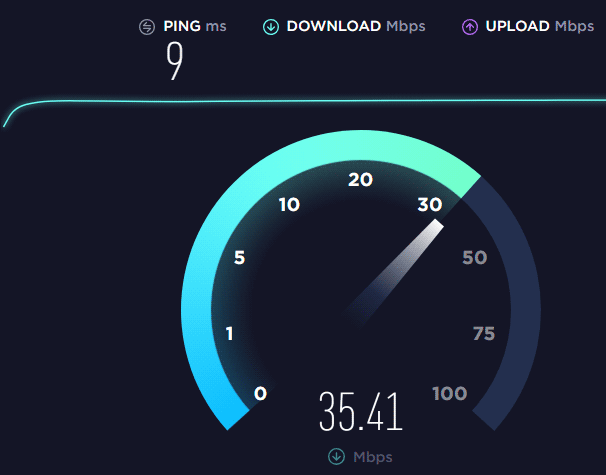 They would do speed test and sure, you can get a nice fast speed with an online test because it takes the overall duration period of the download test and creates an average as a final result. If you’ve ever ran a speed test and noticed slight delays or glitches during the actual test or certain points in which your speed meter stops for a second or drops down, then you may be the victim of latency or a bad modem with the Puma 6 chip. What is latency / jitter? Latency is the delay in transmission of data over the internet. There is Network Latency and disk latency. In this case we’re dealing with Network Latency over the internet. A delay of just a few milliseconds can start a chain reaction of your entire data packet being delayed from start to finish. When you are using the internet for real time activities such as gaming, any latency at all is unacceptable and you may notice real time ping spikes. Or in worst case scenarios, packet loss. Dropping packets is never a good sign and this is likely the reason you always have buffering on your streaming videos. You can test this by running a continuous ping. While you can see dropped packets with a ping test, it is not a reliable test for all latency and jitter. Keep reading for simple online one click test if you do not want to run a continuous ping to observe packet loss. As an internet dweller with dual monitors, I always have a window open running a continuous ping to this site to watch for downtime. You may not even have a bad modem but still experience lag or packet loss. This can be from a poor wifi signal or an older slower router. You can get a good modem and still have issues with an older router so be sure to buy a good wifi router with your new modem. 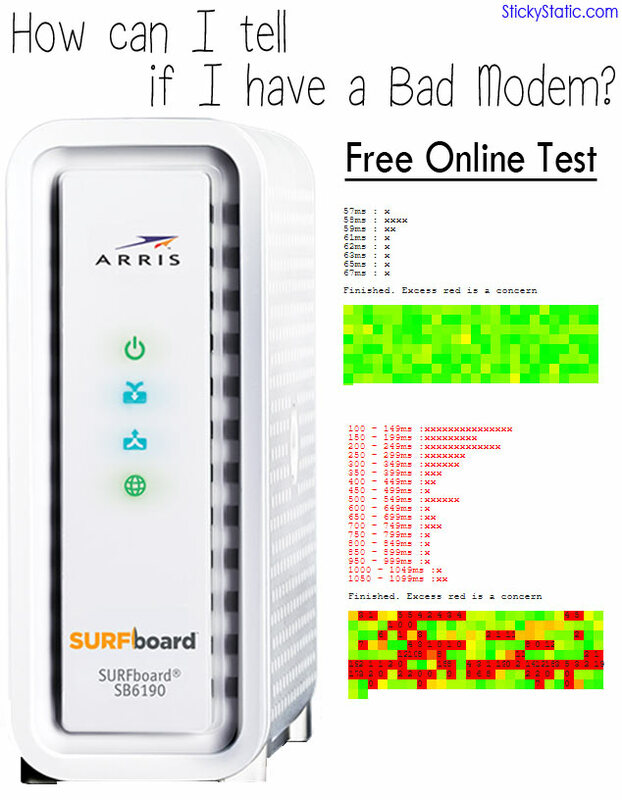 Before we show you a list of bad modems, we’ll say the most popular bad modems are the ARRIS SB6190 as well as the SVG2482AC and the Netgear CM700. However there is wide array of modems that ISP’s have released to their unsuspecting customers such as the following. Important Note: There may be other bad modems out there not on this list. It would be impossible to name them all. But the deciding factor is if your modem has a Puma 6 chip. If this is the case, it is likely already giving you problems. Here is a set of free online tools to check if you have a bad modem. These bad modem test can get you moving in the right direction. Now keep in mind, it is not always the modems fault. For one, it could be your line or connection. But this is the place to start when troubleshooting to see if the problem is your modem. It is important when running these test that you plug directly into the modem so that you eliminate the possibility of “wifi interference” or any packet loss accrued from the wireless router itself. If you run these test on wireless and you have a bad router, that could be your issue. Of course it won’t hurt to run the test now, but just know if you get bad results, it could be your router. If you get good results, you have a good modem and router. But for true results on a bad test, you must eliminate this possible scenario by plugging directly into the modem. If you run these test straight from the modem and everything is fine, you just discovered that you should probably buy a new router. If you run these test from the modem and everything is haywire, you now know it is either your modem or the actual line. It is likely your modem so just buy a new one, run the test and if everything is fine, you figured it out. If everything is still bad, you can return the modem and tell your ISP you ran test on a new modem and have pinpointed it to their line. But it is almost always the actual modem so don’t count on that. How do I know? I worked Tier II Tech Support for the largest ISP in America for 2 years. And I just gave you the exact troubleshooting steps needed to determine if it is your modem, router, or the line. Good luck! You likely already ran this test as it is the most popular speed test available, but when you did it, did you notice if it was a steady constant or did it bounce up and down? This is a simple test, not the best one to find the trickiest of bad modems, but good to run while you’re at it. It includes a simple jitter test and a normal speed test. This is an extended ping test with reach around the globe. A bad modem can still score good here at the right moment in time, but you should run the test. And vice versa, a good modem can score bad from time to time depending on hops between you and the far reaching servers. By default this test may have servers selected around the world and you would surely expect latency and spikes. So be sure to uncheck servers outside of your region for a more accurate test result. It would be normal to have occasional spikes even on a good modem, as shown here. I wish I had a bad modem to show you some bad results but you will know right away if you are getting negative test results. Another ping and jitter test. However this one will likely not work for you because it sends pings from its server to you. Most routers have respond to ping from WAN set to off by default and you will not reply to their test causing a time out. If you know how to enable your reply to ping from WAN, go do it then run the test. It is usually under firewall in your router settings. This tool was made specifically for testing for that bad Puma 6 chip. Your results should be mostly green. If you get a lot of red, you are the proud owner of a bad modem and must replace it. If you are really on a budget, it does not get any better than this super cheap modem. There is no simple fix for these bad modems. Manufactures have even tried firmware updates that have not resolved the issues. Which is why the newest modems all use the Broadcom chip. So if you really want to solve your problem, you gotta go new. As a result of running these free online test, you should now know if you have a bad modem with poor speeds. If you have any questions, please ask below and share with your friends so they can be sure to get the most out of their internet speeds. Hey there, I was thinking about getting the NETGEAR CM500-1AZNAS cable modem & wondering if this might be a good one? from the little info I’ve seen online, apparently it does have the good, broadcom chip, and we already have an ac WiFi router, and it’s cheap. We have the 100 Mbps package from spectrum. Yeah, for those speeds this will be your modem. The newer ones have the PUMA chip.